Bitcoin Press Release: Virtual reality has quietly established itself as an increasingly versatile technology in the past few years, proving that beyond gaming, it has the potential to generate excitement and engage users across multiple industries. May 3rd, 2018, London – Virtual reality, having made its way into school classrooms, society has gone as far as to label it as the future of education to refer to the benefits it provides students and educators. 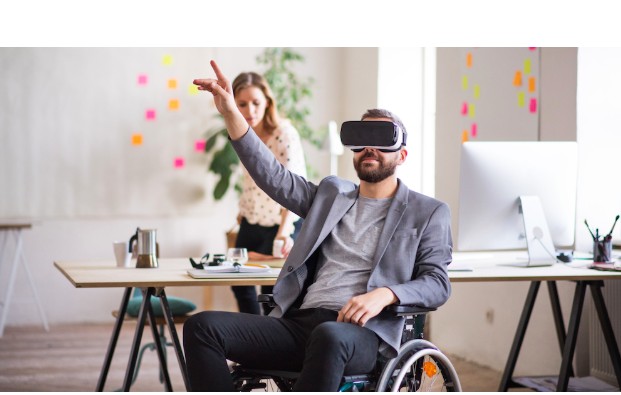 VR technology enables students to apply their newly acquired knowledge in simulated environments, record and track their progress as well as allowing them to connect to experts, all within one medium. Samsung conducted a nation-wide survey in the US on more than 1000 K-12 teachers in 2016, concluding that 86 percent of teachers felt that it is was a challenge to keep students engaged in the curriculum with existing technologies. In the age of social media and smartphones, the desire to focus on information presented in the form of textbooks may pale in comparison to the urge for students to check their latest Instagram stories or Facebook feed. Samsung’s survey notes that 93 percent of teachers believed that their students would be excited to use VR technology in the classroom and 83 percent believe that it may help improve learning outcomes. Teachers consider VR to be effective in helping students understand different concepts and form greater collaboration as well staying motivated in the classroom. VR essentially brings learning to life in an incredibly engaging manner, mitigating a number of learning challenges that students may face. In VR, students are able to learn through active participation in a life-like manner, allowing them to feel more engaged to the subject material than other traditional mediums, subsequently leading to more effective application and retention of the information. A research report conducted by Beijing Bluefocus E-Commerce Co. and Beijing iBokan Wisdom Mobile Internet Technology Training in 2016 found that VR-based education resulted in better test scores and knowledge retention amongst Beijing high school students, in comparison to traditional classroom learning. However, the most significant finding of their study was perhaps the fact that the children who had scored below average in the pre-study test outperformed the test’s best performers, after experiencing a VR-enhanced curriculum. These reports are mere indicators of VR being able to enhance classroom learning and there is still much work to be done; it is a very positive sign for VR learning moving forward. ImmVRse, a blockchain-based VR content sharing platform is a firm believer that virtual learning can revolutionize learning, as we know it. The ImmVRse platform, aside from its predominantly entertainment based content, also aims to serve as an educational medium with a category dedicated to learning and teaching. ImmVRse is currently partnered with Kingston University and Imperial College London to further research into the values in education as well as other sectors. One research in particular revolves around understanding the effect of VR on neural activity to improve understanding on how the technology affects individuals’ ability to absorb information. A compelling motive behind the continuous research on technologies such as VR is the enormity of its potential to improve the lives of millions of people. ImmVRse is therefore proud to announce a partnership with a truly innovative and groundbreaking company, Basis Neuro. Basis Neuro is a platform that allows for the creation of brain-controlled gadgets and services. The partnership will allow ImmVRse to access algorithms for analysing brain signals which ultimately will help to further understand the complex relationship between VR and neural activity. ImmVRse is the source of this content. Virtual currency is not legal tender, is not backed by the government, and accounts and value balances are not subject to consumer protections. Cryptocurrencies and tokens are extremely volatile. There is no guarantee of a stable value, or of any value at all. Token sales are only suitable for individuals with a high risk tolerance. Only participate in a token event with what you can afford to lose.This press release is for informational purposes only. The information does not constitute investment advice or an offer to invest. The post ImmVRse to Explore the Impact of VR on Learning and Neural Activity appeared first on Bitcoin PR Buzz.